‘Bored pier’ is the term given to a non-displacement pile formed in cohesive ground conditions where an auger and soil column may be extracted from the drilled hole without collapse, allowing reinforcement to be lowered into the hole and concrete to be pumped in to complete the pile. Where granular soils or groundwater present more challenging conditions, a steel casing may be used to support the hole and allow auger extraction without collapse. Bored piers are typically used as foundation piles to limit settlement of the structures they support, however the technique may also be applied to the construction of soldier piles for retaining walls. The bored pier installation process involves minimal noise and vibration in comparison to driven pile techniques. ASP Piling has the specialist equipment and expertise to install bored piers across a wide range of site-specific soil, rock and groundwater conditions. 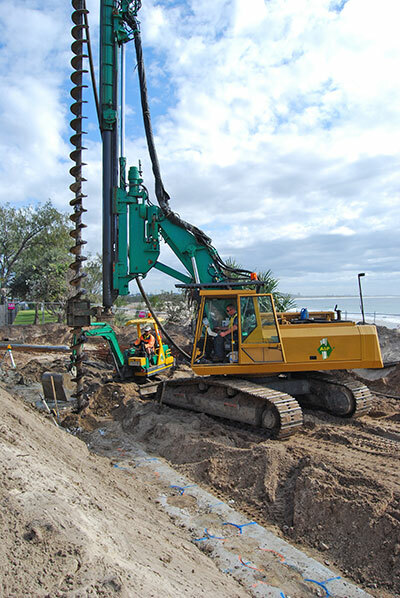 ASP Piling installs bored piles all over Australia including throughout Qld, NSW and the ACT. We can also service many other locations and states. Contact us for more information about deploying to your locality. ASP utilises an extensive range of purpose-built drill tools including sand, soil and rock augers, clean-out buckets, core barrels, and down-hole hammer drills to remove soil and rock. ASP can offer bored piers drilled to depths of up to 16 metres in a range of diameters from 300mm to 750mm depending on the geotechnical conditions and project requirements. Efficient & Cost Effective: In suitable ground conditions, bored pier installation can be fast and economical. Quiet: ASP’s bored piers are installed with very little vibration and with much lower noise levels than driven piles. Flexible: Bored piers can be used in a wide variety of applications. Demonstrating the reach and site accessibility of an ASP bored piles rig on a narrow beach-front site.